Listen to this track by transplanted Ottawa trio now based in Toronto, the Balconies. It’s their new single “Kill Count” with B-side “Tiger”, both currently featured on an EP of the same name Kill Count, and serving as an outlier to their upcoming 2012 full-length album. 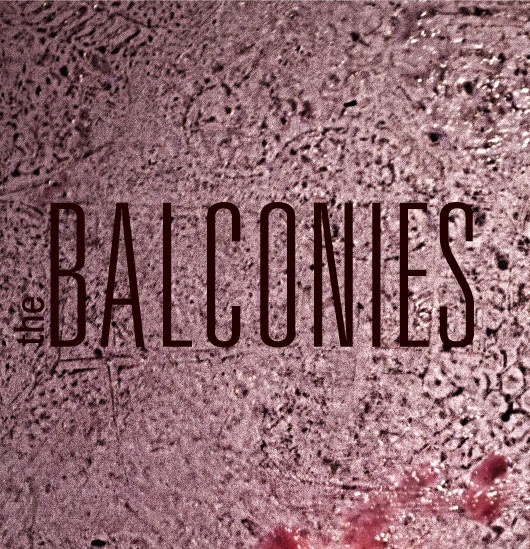 You can buy the EP when you see the Balconies live. The band have traded in a style of pop-rock music that incorporates power-pop, post-punk, and with a dash of surf-rock in there for good measure just to make it all danceable. Lead vocalist and guitarist Jacquie Neville’s voice is a soaring instrument, backed up by the fluid bass playing of her brother Stephen Neville, and anchored by drummer Liam Jaeger. The band started in the basement as two classically trained music students and a brother. Their subterranean rock ‘n’ roll racket led to success with the impossibly catchy single “Serious Bedtime”, a self-recorded release, and shared stage appearances with Sloan, Mother Mother, Cold War Kids, and others. They’ve since been named as a band to watch by the National Post and MSN Canada. I was offered a download of the Balconies’ recent EP. Through the wonders of email, I chatted with drummer Liam Jaeger on the subject of its lead track, vinyl releases in the 21st century, working up their forthcoming album, and about the so-called inevitable trek from Ottawa to Toronto. The Delete Bin: This track. “Kill Count” is clearly in the rock camp, but there’s something of a dance feel to it as well to my ears. Is the indie crowd as you see it coming around to the idea of dancing, and not losing their cool? How have crowds responded to it in a live setting so far? Liam Jaeger of the Balconies: We are aware that it’s impossible to appeal to everybody, so we make music that satisfies us and makes us want to have a good time. We love playing loud and hard and sweaty. We love it when people show that they’re feeling what we’re doing. At shows we’re all about getting the crowd involved. We’re losing our minds on stage so we want to drag everyone in with us. Our goal is to remind everyone that there’s nothing fun about watching from far away and standing still. DB: The song is a spearhead for the EP, but also for the upcoming full-length album. How does this song fit into the new batch of songs? LJ: The song ‘Kill Count’, is a good example of what’s coming up on the new record. Sonically, it is much more rich and heavy than our first record was, but it’s how we had set out to sound from the beginning. Anyone who’s seen us live will agree that the first record seemed watered down in terms of energy, when compared to our live shows. The songs on the upcoming LP are high-energy pop songs that are structurally simple, yet dense in character. DB: In addition to a digital release, you’ve also released this as a 7″ single, which at one time was a matter of course for any band. Is there a sense of permanence attached to that release for you, knowing that you’re not only putting music out there, but an artifact that fans can hold in their hands? LJ: Of course. It is true that people are taking recorded music more and more for granted as time goes on, but at the same time, vinyl will never lose its place as the best way to enjoy music that is special to you. The experience of putting on a record and listening to ‘real vibrations’ will always be better than scrolling through thousands of digital files and pressing play on a tiny device. CD’s are a bit better than mp3’s, but there’s no beating the ‘realness’ of vinyl. DB: Like this song, and “Tiger” the b-side, the new forthcoming full-length album is produced by Jon Drew (Tokyo Police Club). How did that collaboration come about, and how did it unfold in the studio? LJ: Jon Drew is a master of capturing a band’s live energy in recordings, as well as tweaking the arrangements of songs to maximize character and overall impact. Every day of recording was a blast for us, and we are ecstatic about the final result! We couldn’t have done this record with anyone else. DB: The band has made what has been described as an ‘inevitable’ move from Ottawa, where you’re from, to Toronto, which is in some ways understandable in our country. Do you see it as inevitable for your band, and what kind of adjustments have you all made as a result? LJ: It was always inevitable for me because I grew up in Toronto, so my family and oldest friends are here. While studying in Ottawa, I met Jacquie and Steve, who grew up in Ottawa. Once we finished school it was obvious that we’d have more fun in Toronto just because there is more of everything here (including fun!). We still love Ottawa and play there about as often as we did when we lived there. DB: When it comes to the idea of ‘making it’, that definition has changed in the age where a band like The Balconies can build audiences and momentum without a label, using social media, and working with independent music channels to do it. What’s the horizon line for success that you’re focusing on? LJ: We’re extremely happy with how things have been going for us. Our biggest goal is to one day be able to support ourselves entirely by making music, which we know takes years and years of constant hard work! DB: The Balconies are a part of another wider rock tradition – you’ve got siblings in your band! Any sibling moments you’d like to share? LJ: We’re all very close in the band, and the family thing is really big for us. I grew up with a similar family dynamic to Jacquie and Steve, so we always feel at home with each other. There’s also the stronger sense of commitment to each other that comes along with it, so that’s big with you’re dealing with something as delicate as a musical career together. The Balconies are currently embarking on a dates with Bedouin Soundclash and Birthday Boys, should you be in the Toronto and outlying areas. Check the Balconies MySpace page for the whens and the wheres. Also, be sure to like the Balconies on Facebook, for those who are Zuckerbergianly inclined. When you go to a Balconies show, you can buy the EP. You should. If anyone has a chance to see this band, or listen to their records I say go for it. I had the chance to see them play a show Thursday night in Ottawa, (not my first time) and once again they put on a very entertaining show. They also played a bunch of new songs from the album they’re set to release next year. Killer Stuff. I wrote about it too, if you’re interested in reading it.